With some Santorini caldera pictures I have made a measure. June 9 (10° step, in 45 days, to Azi 300°). 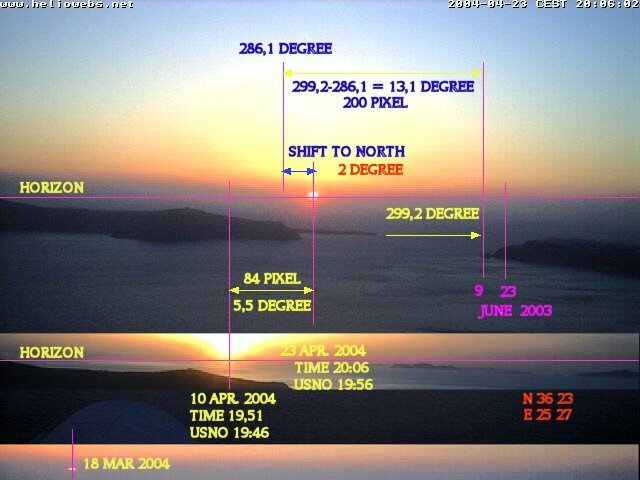 The marked photo shows that On Apr 23, due to a LEAN, the Sun is too far SOUTH at this time, temporarily. Moon was at Azi 275° Alt 20-25° (Skymap Azi 295° Alt 12°) too HIGH and SOUTH, due to a strong LEAN. Venus Azi 280° Alt 15-20° (Skymap Azi 298° Alt 8°) again too HIGH and SOUTH, due a strong LEAN.